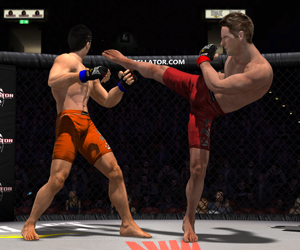 We were thrilled to see all the great responses to Bellator: MMA Onslaught at this year’s E3. Take a look at some of the reactions, including some very detailed previews and overviews of the game’s features. Unbalanced and sloppy gameplay – Sports games have to make a choice right at the beginning. Is this game going to be a simulation or an arcade game? Onslaught doesn’t know what it is. Some parts feel like a simulation, others like an arcade action game. The elements do not come together well. There are two “life” gauges for lack of a better expression. One is regular health; when it gets to zero you are knocked out. The other is stamina. Each action you take uses stamina which slowly replenishes over time. But if you use too much stamina you can put yourself in danger of a flash knockout. It’s very easy to pummel an opponent for an entire round only to get knocked out with one punch due to lack of stamina. Obviously the idea is to play a balance between attack and defense but in practice it doesn’t work well and certainly isn’t much fun. The crux of the whole problem is that the game plays in a way that makes you want to unload a salvo of punches and kicks. But if you do so you’re almost guaranteed to lose. The game really feels like you should be able to let loose but you can’t and this just feels wrong. Next Post: Bellator: MMA Onslaught Out Now!